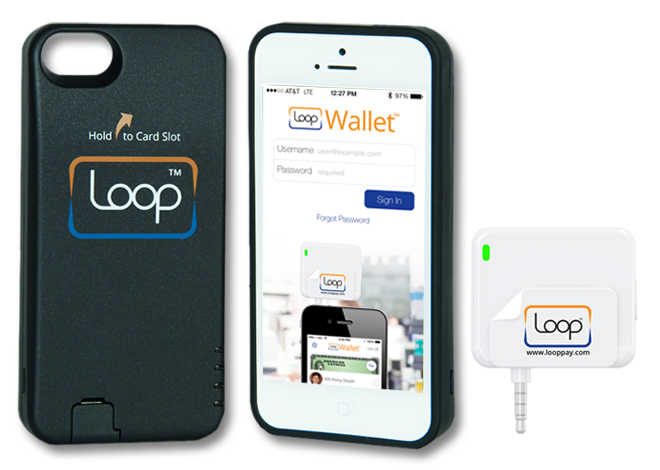 LoopPay has begun shipping its iPhone case, which can be used to make credit card payments at any magnetic swipe terminal. Instead of using near-field communications or special software, Loop’s ChargeCase creates a magnetic field that emulates the data stored on a credit card and can be read by any point-of-sale terminal its held up against. Last year, I reviewed Loop’s fob, and was actually quite impressed with how simple it was to use. The ChargeCase is basically the fob in a different form factor designed to fit around an iPhone 5 or 5s. It connects to the iPhone through Bluetooth, instead of through the audio jack like the fob, but otherwise the principle is the same. Pressing a button on the side of case causes it to emit its magnetic field transferring your credit card data to the point of sale terminal, just as if you had swiped your physical card. The case works independently of the phone, so you can make a payment if the Loop app isn’t active or even if the phone is off. The case does offer some advantages over the fob, though. First, since it’s in constant connection with app, it’s much easier to switch between cards, and it keeps a running tally of transactions you’ve made. It won’t record any details of about the amount or location of the transaction, though Loop founder and CEO Will Graylin told me that feature is coming. Second, the ChargeCase has a built-in battery pack, which Loop says will boost an iPhone charge by 60 percent. The ChargeCase keeps a power reserve so users can continue making payments even when both the iPhone and the battery pack are drained. Loop began offering the ChargeCase via a Kickstarter campaign in November. Those initial investors have received their cases and have begun testing the device, Graylin said. Starting today, Loop is making the ChargeCase available to the general public on its website for $99 and will start shipping it to customers who pre-ordered the device. Louis, thank you. Yes, we plan for several more products for market entry for the remainder of the year and are working on cases for upcoming Apple and Android devices. Please visit LoopPay.com to learn more about our product and leave your email for our regular newsletter updates. Nicely Done…Are you planning to support the iPhone Air (Gen 6) when it is released later this year? My name is Jennifer Ni and I am the VP, Product of Marketing atâ€¨ LoopPay. Let me address the comments about EMV implications to mag stripe cards. There are 15.7 billion paymentâ€¨cards worldwide with mag stripes, out of which around 1.5 billion are â€¨EMV-enabled chip cards. The rest include private label cards, credit and debitâ€¨ cards, gift cards and more. In short, mag stripe readers and mag stripe cards will be used to conduct a great percentage of commerce. The future of payment security can be built on cloud-based generation of signatures. Loopâ€™s Magnetic Secure Transmission technology transmits not only static track data to existing mag stripe readers, but also can generate dynamic / tokenized track data, to provide immediate fraud reduction on every card issued to Loop users. This complements EMV efforts, and we think can bring tremendous benefits to card issuers, and merchants to strengthen security measures at a much lower cost. It may turn out that card payment security will be best served by replacing physical cards with mobile form of existing system built on decades of commerce investment. Although cards, both magstripe and EMV, will be around for a long time, phones, wearables and other connected devices are the future forms we need to have our foresight how we build our payment security on these devices. USA must be the last place on earth still using archaic and insecure mag-strip credit cards. This product is useless everywhere else. On the contrary, I travel a lot, I have used this product in 5 countries in Europe, 2 in Latin America and 2 in Asia and it always impressed clerks and my business counterparts as in the US. This company has also a way to create dynamic transactions the same way EMV chip card do. Let’s not forget that the data they store are in a chip card and that EMV cards also simply store the same track data you have on a magnetic card but send them in a dynamic way. This company has a good future and their initial product seems the first of a long serie that will get integrated into a phone eventually. At least this is what they are claiming and it looks very plausible.